Confirmed onsite consult scheduled - no show. I attempted to call the Senior Designer I had been in contact with for the last two weeks via email with no luck. My wife and I couldn't be happier with the choice of Unique Pools and Landscapes for our full backyard remodel! Here are the reasons why. 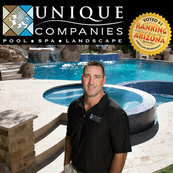 Unique Landscapes completed a large and lengthy pool remodel and complete landscape project on our acreage in Scottsdale.